With the use of PGP, BlackBerry users can send encrypted email messages that only the intended recipient can decrypt and read. A technical explanation of how this works is provided below. PGP cannot prevent email messages from being intercepted, but since messages between PGP BlackBerry devices are encrypted, an intercepted message would be meaningless and unreadable. PGP encrypted email can only be decrypted by the intended recipient. Using PGP, BlackBerry users can also authenticate their identity when sending secure messages, so the recipient can guarantee the message was not sent by an imposter. This is called digital signing with PGP. PGP is a widely used method of protecting personal and private communications between individuals and businesses. Since its invention in 1991 it has become the de facto standard in email encryption, and throughout the years many updates have been released to improve it. It happens to be very well supported on BlackBerry devices as well. By adding PGP encryption to the added security already built into a standard BlackBerry, PGP BlackBerry users are free to send & receive encrypted email between each other and other companies, as long as they implement the same security standards. Your email is nobody's business except your own. Take the necessary steps to protect it. Trust Myntex to provide your BlackBerry PGP encryption. 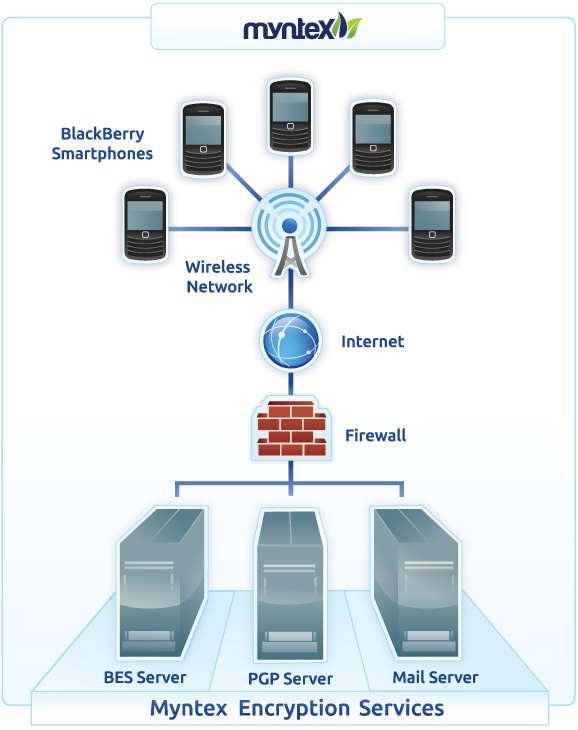 Myntex implements PGP for BlackBerry the way it was designed to be implemented. By enforcing the strict use of the most advanced algorithms available, we ensure our clients' privacy and security in a safe and secure environment. For maximum security, our BlackBerry PGP encryption service utilizes AES 256 bit PGP encryption with a 4096 bit RSA key format. The servers used for our PGP service are managed on-site by our company, and not outsourced to a foreign location. This permits us to restrict access to our servers, prevents unauthorized access, and mitigates corruption issues that plague off-shore servers. PGP for BlackBerry uses a modified public key system to encrypt email messages. Every BlackBerry user has a private encryption key known only by them (and not known by Myntex), and a public encryption key that other people need to know in order to communicate with them. The sender composes an email message and hits Send. PGP creates a random, one-time Session Key that's used to encrypt the compressed email message on the sender's BlackBerry. This Session Key will also be required to decrypt the message. The Session Key is then encrypted using the recipient's public key, which is specifically tied to the recipient's BlackBerry. Decryption can only be done using a private key held by the recipient, on that device. The encrypted email and encrypted Session Key are both sent to the recipient. If the message happens to be intercepted at this point, it will be meaningless because both the email and Session Key are encrypted and can only be decrypted with the recipient's private key. PGP automatically decrypts the Session Key with the recipient's private key. Note that only the recipient knows their own private key, and Myntex does not know any clients' private keys. This key is tied to a single device (e.g. BlackBerry), so no other person or device is able to decrypt the Session Key. PGP uses the Session Key to decrypt the compressed email message. The recipient can read the email. For further reading, see Fred's PGP page, the PGP 6.5.1 doc, or read about Philip Zimmermann. As with any method of encryption, the strength of the encryption algorithm is only as strong as the computing power of today's technology. As technology and computational power increase, the algorithms for PGP's key strength are increased to match. So PGP remains a secure and strong means of encrypting email. PGP has no back doors, and this was proven by distributing the source code publicly.